Last week, we held our first book club of the year for BigBoy and some fellow homeschooled book lovers. 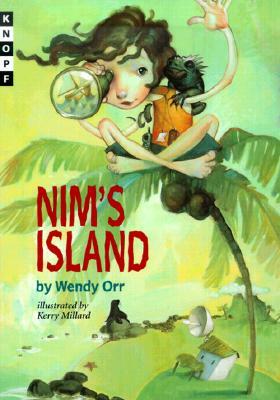 Nim's Island by Wendy Orr is a short little adventure story about a homeschooled girl named Nim who lives on an island with her dad, the scientist. They turned this book into a fun little movie not too long ago. Most of the kids hadn't seen the movie so that made the book club extra exciting… I showed them the opening scene and I'm pretty sure they were going to go home and beg their parents to watch the whole thing. (BTW… my kids only made it through the first ten minutes of the sequel, Return to Nim's Island, before they were begging me to turn it off it was sooooooo bad. Just FYI.) And all of the kids in the book club said they enjoyed this book so much they wished it had been longer! Quite a compliment to the author, if you ask me! A couple of kids tasted it. They said it was bland. So, for book club, I demonstrated what is inside of a coconut and we discussed things like marine biology, whether a person can really be swallowed whole by a whale, what sort of things Nim and her dad study on their island, what the island itself might have looked liked, what really happened to Nim's mother and bioluminescent plankton (Nim's favorite kind). (You can find lots of discussion guides out there for this book just by looking up "Nim's Island Teacher Resources".) For the last part of the discussion, I showed them this really neat clip of bioluminescent plankton and they were spell bound! We also discussed the differences between how a book tells a story and how a movie tells a story while I used some scenes from the movie to help illustrate my points. Yeah… they thought it was cool.